Bomb jammers are used in convoy protection, checkpoints, border crossings, and other military setups that are prone to IED or remote operated device attack. CT-6080DDS 800W DDS bomb jammer is a new generation of jammer signal synthesizers that use digital signal generation for more precise control of the output phase across frequency switching transitions. Taipei, Taiwan, April 6, 2019 - /PressReleasePoint/ - Jammers4u launches bomb jammers for prevention of remote controlled IED bomb attacks. Prevention of attack is the best strategy for VIP or location safety. IED, Bomb DDS Jammers are defensive devices that are used to protect an area from any remote operated IED or bombs. These are extremely powerful devices that can cover 1km radial zone and keep it safe from radio controlled car bombs, road bombs, ambush by remote IED and remote controlled terrorist devices. Bomb jammers are used in convoy protection, checkpoints, border crossings, and other military setups that are prone to IED or remote operated device attack. Engineers have anticipated all frequencies used in such devices and designed CT-6080 DDS as an ultimate, all-in-one prevention from remote operated attacks. CT-6080DDS 800W DDS bomb jammer is a new generation of jammer signal synthesizers that use digital signal generation for more precise control of the output phase across frequency switching transitions. Rugged Pelican case and rigorous quality testing are guarantee that jammers will work when needed in any terrain conditions. 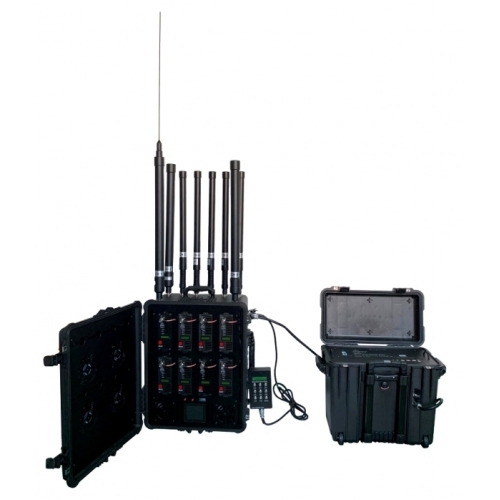 Being radio frequency jammer, Digital Bomb Jammer CT 6080DDS can be used to block any radio communication in zone. RF communication can be a security issue for high level military, government, diplomatic missions, embassies , military bases and offices, prisons, etc. Jammers4u bomb jammer effectively block RF communication as well as remote RF operated devices so it can be effectively used in both scenarios.